Table 1. Occurrence of bacterial species isolated from inanimate surfaces surrounding ICU-beds. Acinetobacter baumannii is one of the most frequent Gram-negative opportunistic pathogens associated with hospital-acquired infection worldwide. We briefly describe A. baumannii isolates that were recovered from surrounding ICU bed surfaces, exhibiting multidrug resistance phenotype and belonging to some widely spread clonal complexes of clinical A. baumannii isolates. 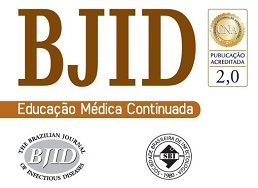 We have conducted a microbiologic surveillance study to investigate the presence of bacterial pathogens on inanimate surfaces surrounding ICU beds in a tertiary Brazilian hospital. The samples were collected on a single occasion, using sterile swabs from five high-touch point-surfaces surrounding ICU beds4 [right (RR) and left (LR) side rails and bed height adjustment buttons (BB), infusion pump buttons (IP), and over-bed table (OT)], inoculated into TSB medium, and incubated at 37°C for 18h. Collected materials were cultivated on routine agar plates for Gram-positive and Gram-negative isolation. Morphologically distinct colonies were taken for species identification using MALDI-TOF Biotyper (Bruker Daltonics, Bremen, Germany). Subsequently, we focused on the analysis of ACB isolates, considering their higher recovery frequency and the epidemiological importance for HAIs. The genetic relationship between the ACB isolates was determined by SmaI-PFGE and antimicrobial susceptibility testing was performed by CLSI broth microdilution. Carbapenemase production was determined by CarbAcineto NP test5 and the presence of carbapenemase encoding genes was investigated by PCR and sequencing for blaOXA-23, blaOXA-24, blaOXA-51, blaOXA-58, blaOXA-143, blaIMP-1, blaNDM, blaVIM, blaSPM and blaKPC. Additionally, the association of ISAba1 element with blaOXA-type genes and with the chromosomal Acinetobacter derived cephalosporinase (ADC) was also investigated by PCR. Based on PFGE profile, four isolates from distinct clusters were selected for whole genome sequencing (WGS) using Nextera XT DNA Library Preparation Kit and the MiSeq platform (Illumina, San Diego, CA). The draft genomes were assembled and annotated by SPAdes and RAST Prokaryotic Genome Annotation Server (www.patric.org). The assembled contigs were analyzed by BLASTn searches against MLST and ResFinder 2.1 web-based database at Center of Genomic Epidemiology services (https://cge.cbs.dtu.dk/services) for MLST-typing and identification of acquired antimicrobial resistance determinants, respectively. Mutations in nucleotide and amino acid sequences of Quinolone Resistance Determining Region (QRDR) and ADC were also explored. Overall, a total of 67 bacterial isolates were recovered from the investigated surfaces. For further analysis, a single species isolate per sampling surface was included, resulting in 59 isolates (57.6% Gram-positive and 42.4% Gram-negative). ACB was the most frequently isolated (23.7%), followed by Enterococcus faecalis (16.9%) and Bacillus cereus (15.2%) (Table 1). The genetic relationship analysis of the ACB isolates showed the predominance of at least two different PFGE profiles. Six (06/14) ACB isolates were grouped into the designated clone A cluster, while the other five were classified as belonging to cluster B (Fig. 1). Clone A isolates were recovered from at least one target point-surface surrounding four different beds (02, 06, 10, and 13) and clone B isolates were spread over three beds (02, 03, and 15) distributed in the ICU. PFGE technique failed to type three ACB isolates (NT, non-typable). The isolates Ab107, Ab124 (clone A), and Ab112 (NT-profile) had the whole genome sequenced and briefly analyzed, while the WGS failed for Ab83 isolate (clone B). MLST analysis revealed that Ab107, Ab124 (clone A), and Ab112 (NT-profile) belonged to two different ACB clonal complexes: STB227/STP79 (CC131B/CC79P) and STB405/STP1 (CC109B/CC1P). It is noteworthy that isolates belonging to all these ACB clones were recurrent over the collection time points (May. June, and August/2015). Occurrence of bacterial species isolated from inanimate surfaces surrounding ICU-beds. LR, left side rail of bed; RR, right side rail of bed; IP, infusion pump buttons; BB, height adjustment buttons of the beds; OT, over-bed table; n, number of isolates; %, percentage of isolates. Genetic relationship, antimicrobial resistance genes, and antimicrobial susceptibility profile of Acinetobacter baumannii strains isolated from inanimate surfaces surrounding ICU-beds. Legend: NT – non-typable profile; ID – isolate identification; ND – not determined; MLSTB – Bartual scheme; MLSTP – Pasteur scheme; OXA – oxacillinase genes; ISAba1 – insertion sequence ISAba1 upstream each evaluated gene; MIC – minimal inhibitory concentration; CRO – ceftriaxone; CAZ – ceftazidime; FEP – cefepime; IPM – imipenem; MEM – meropenem; CIP – ciprofloxacin; LVX – levofloxacin; AMK – amikacin; GEN – gentamycin; LR – left side rail of bed; RR – right side rail of bed; IP – infusion pump buttons; BB – height adjustment buttons of the beds; OT – over-bed table. All ACB isolates displayed carbapenem resistance and resistance to the other tested β-lactams (ceftriaxone and ceftazidime), while reduced susceptibility to cefepime was observed in 85.7% (12/14) and resistance to at least one of the tested aminoglycoside drugs was shown by these isolates. Ciprofloxacin-resistance was observed among all ACB isolates and 92.8% of them presented reduced susceptibility to levofloxacin. All the isolates were susceptible to ampicillin/sulbactam and polymyxin B (Fig. 1). Carbapenemase production was observed in all 14 carbapenem-resistant ACB isolates and the acquired OXA-carbapenemase encoding genes blaOXA-23 (4/14; 26.6%), blaOXA-72 (2/14; 14.9%) and blaOXA-253 (1/14; 7.1%) were found in seven of those ACB isolates. All ACB isolates carried the intrinsic blaOXA-51-like gene. Upstream association of ISAba1 to OXA-genes among these isolates was observed for the blaOXA-23 but not for the other acquired or intrinsic blaOXA-like genes. However, ISAba1 element was identified upstream the blaADC gene in 93.3% (13/14) of ACB isolates. Additionally, the blaADC allelic variant carried by the ACB isolates which had the WGS determined showed 98.0% of identity with the carbapenem-hydrolyzing ADC-68 sequence and presented the same of some ADC-68 amino acid substitutions involved in carbapenem-hydrolysis.6 None of the ACB isolates carried blaOXA-58-like, blaKPC or metallo-β-lactamases encoding genes. QRDR analysis revealed the S83L substitution in the predicted DNA gyrase (GyrA) amino acid sequence of all genome sequencing isolates, in addition to S80L (Ab112 and Ab124) and S80Y (Ab107) substitutions in topoisomerase IV subunit (ParC). ResFinder search against the WGS showed the occurrence of genes for resistance to aminoglycosides [aadA1 (ant(3″)-Ia]; aadB; aph(3′)-VIa (aphA-6); strA (aph(6)-Ia); strB (aph(6)-Id) and aacA4); phenicol (floR); sulfonamide (sul2); trimethoprim (dfrA1); macrolides (mphE); and lincosamides and streptogramin B (msrE). These findings emphasize the MDR ACB clones’ capacity to survive on hospital inanimate surfaces, representing a risk for HAI; highlight the importance of hospital environments as a reservoir of MDR pathogens responsible for HAI and outbreaks; and the need for better hygiene practices to eradicate them from the hospital environment, especially those surfaces considered as high-touch in the vicinity of beds. We would like to thank Júlia Campos (Centro de Tecnologias Estratégicas do Nordeste - CETENE) for her assistance in MALDI-TOF species identification and the Núcleo de Plataformas Tecnológicas e de Bioinformática (Centro de Pesquisas Aggeu Magalhães) for all furtherance. This work was supported by the Fundação Oswaldo Cruz (FIOCRUZ, Brazil) and Fundação de Amparo a Ciência e Tecnologia do Estado de Pernambuco (FACEPE) [grant process No. PROEP/APQ-1628-2.12/15]. L.A. Shimose, E. Masuda, M. Sfeir, et al. Carbapenem-resistant Acinetobacter baumannii: concomitant contamination of air and environmental surfaces. N. Karah, A. Sundsfjord, K. Towner, Ø. Samuelsen. Insights into the global molecular epidemiology of carbapenem non-susceptible clones of Acinetobacter baumannii. E. Tajeddin, M. Rashidan, M. Razaghi, et al. The role of the intensive care unit environment and health-care workers in the transmission of bacteria associated with hospital acquired infections. K. Huslage, W.A. Rutala, E. Sickbert-Bennett, D.J. Weber. A quantitative approach to defining “High-touch” surface in hospitals. L. Dortet, L. Poirel, C. Errera, P. Nordmann. CarbAcineto NP test for rapid detection of carbapenemase- producing Acinetobacter spp. J.H. Jeon, M.K. Hong, J.H. Lee, et al. Structure of ADC-68, a novel carbapenem-hydrolyzing class C extended-spectrum β-lactamase isolated from Acinetobacter baumannii. A. Elkalioubie, S. Nseir, N. Saad. Acquisition of carbapenem-resistant Acinetobacter baumannii in the intensive care unit: just a question of time?. J.S. Esterly, C.L. Richardson, N.S. Eltoukhy, C. Qi, M.H. Scheetz. Genetic mechanisms of antimicrobial resistance of Acinetobacter baumannii. L.C.S. Antunes, F. Imperi, A. Caratolli, P. Visca. Deciphering the multifactorial nature of Acinetobacter baumannii pathogenicity.